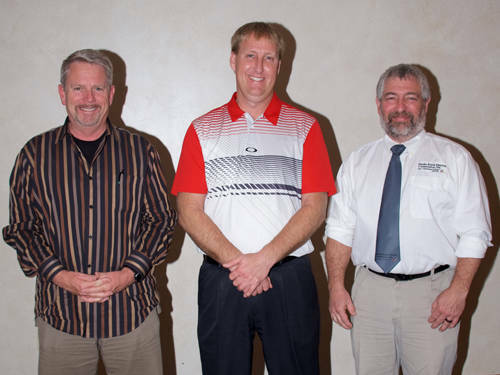 Eric Laux, Aaron Siefring and Tod Carroll were elected to represent the members of districts 1, 3 and 5 on the Darke Rural Electric Cooperative board of trustees. DARKE COUNTY – Darke Rural Electric Cooperative celebrated another year of member service at the 82nd annual meeting of members held March 14 at Romer’s Catering in Greenville. Approximately 270 people attended the lunch and business meeting. Tod Carroll was re-elected, and Aaron Siefring and Eric Laux were newly elected to serve on the board of trustees. Carroll represents District 3 of the cooperative’s territory, consisting of Jackson, Washington, and Greenville townships. Siefring represents District 1, consisting of Mississinawa, Allen and Brown townships. Laux represents District 5, consisting of Harrison and Butler townships. Darke REC General Manager Ted Holsapple highlighted the cooperative’s commitment to system reliability through ongoing improvement projects to the cooperative’s infrastructure. He then updated the membership on planned construction work for 2019, including replacing copper wire and poles, upgrading meters and installing equipment for backfeeding to improve reliability. Holsapple reported a high American Customer Satisfaction Index score of 88 for 2018. Holsapple then detailed the progress of OurSolar, Cool Returns and other programs within the cooperative. The OurSolar program has leased approximately half of the panels at the Hollinger substation. Cool Returns is underway and the co-op is installing radio-controlled switches to participating member’s air conditioners to help reduce the load during peak usage times. Darke REC’s Operation Round Up program, by which members round their electric bill up to the next dollar and donate the change, distributes nearly $24,000 a year to local charities and programs. Brad Flora, chief financial officer of Darke REC, provided the membership with the financial reports for the cooperative. The cooperative had record revenue of more than $15 million as well as record sales as a result of increased electric use. Flora further detailed the breakdown of the cooperative’s budget and how much of each member’s dollar paid for various functions of the cooperative. The cooperative allocated $1.27 million in capital credits to members in 2018. Because the cooperative operates on a not-for-profit basis, any excess revenue is returned to the members in the form of capital credits. The amount allocated to each account is based on electricity use throughout the year. Tom Alban, vice president of power generation for Buckeye Power, updated the members on the transition of operational responsibility at the Cardinal Power Plant from AEP to Buckeye Power. He reported that Buckeye’s rates have remained stable and that flat rates are expected in the near future. Potential effects on rates include environmental regulations and costs of transmission system upgrades by investor-owned utilities that are passed on to Buckeye Power. Wayne HealthCare provided health screenings for members prior to the business meeting, and the meeting closed with door prize drawings for members.